WHAT WE FILIPINOS SHOULD KNOW: During the late decades of the 19th century, the period of Dr. Jose Rizal's study in and travels to Spain, there was an ongoing reform movement in Spanish society (after the failure of the Spanish anarchists) to place their strongest emphasis on the importance of education in achieving their social goals. This period was the heyday of libertarian schools and pedagogical projects in all areas of the country where Anarchists exercised some degree of influence. Although Spain had a universal education law, the majority of schools were run by clerics who used brutal teaching methods and emphasized rote instruction in Catholic dogma. These clerics openly inveighed against any political group, scientific theory, or cultural tendency which displeased the church. Co-education, tolerated in the countryside only for want of school space, was rigorously prohibited in the cities. As most thinking Filipinos know, Jose Rizal was a reformist (while Andres Bonifacio was a revolutionary). 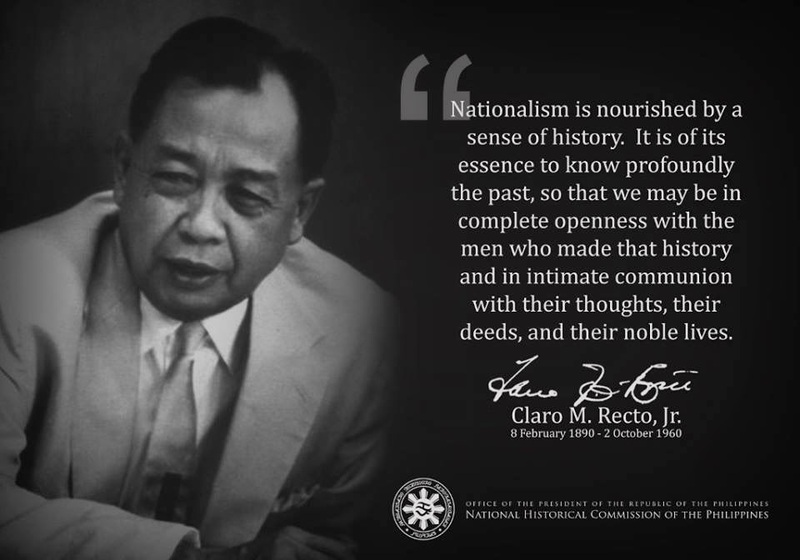 And obviously, Rizal was much influenced by what he witnessed in Spain and the rest of Europe, especially the vast chasm between European Catholicism, which was a vehicle for human dignity and progress in now Western Europe versus Philippine Catholicism, a vehicle for racism, perpetual ignorance and repression of the Filipino natives. Amazingly, 105+ years hence, Philippine Catholicism has not significantly evolved, nor its interpretations of true christianity matured among its hierarchy and followers. Below article was taken from a book about Ferdinand Blumentritt, the Austrian professor who became a close friend of Jose Rizal and who fought, with his pen, for our forefathers and homeland. Please check out the Philippine-Austrian website for more on Rizal, Blumentritt and Philippine history we never learned in school to the present. For the professor from Leitmeritz, a faithful and devout Catholic, the missionaries and monks were naturally the bearers of culture and the apostles of civilization. Moreover, they brought to the natives, who from Blumentritt's liberal view were not wild and cannibalistic, the blessings of the educational system, of hygiene, the institution of law and order, of certain moral concepts, which doubtless were incompatible with some - at least to Western eyes - "immoral" customs of the inhabitants. Indeed, in all his studies, Blumentritt seems, first of all, to have failed to see, or at least, underestimated the political significance of the clergy. Because the Philippines was conquered and held by the sword and the cross, a kind of cleric colonialism emerged. The demarcation lines and jurisdictions between the secular and religious authorities were removed through the union of the church and state; they served both God and King. The most powerful organizations of the church were the monastic orders and their members, the "Frailes" or "brothers". About the end of the nineteenth century, at the time of Rizal and Blumentritt, there were approximately 2,600 monks, who actually governed the Philippines. There were among them 346 Augustinian friars, 327 Recollect friars,107 Franciscan friars, 233 Dominican friars, 42 jesuit friars, 16 Capuchin friars, and 6 Benedictine friars. The monks or "Regulares", who throughout were always Europeans, were almost all Spaniards, and lived in monasteries, took care, and were in command of the army of the Philippine priests, who were called seculars or "Seculares" or priests who did not belong to orders. They lived in the villages and had contact with the people. The priests were, however, governed by the friars. About 1890, only 150 out of 1,013 priests were under the control of Seculares. A faster population growth and the increase and expansion of the parishes would have increased the number of native priests employed. But the monks opposed this. It came increasingly to bitter confrontations between the white and the colored priests, to the first manifestations of Philippine nationalism, awakened by the racism of the monks. Although the Madrid government was represented by the governor general, who, as representative of the King, should be all-puwerful, the real rulers were the monastic generals and the archbishop of Manila. Moreover, the church had stability on its side, which the crown lacked because, in consequence of the numerous government crises in the mother country from about 1853 up to the end of the Spanish rule in the year 1898, there was a total of 41 governors in the Philippines, but only 5 archbishops. The friars had a final say in evervthing. They owned the biggest and the best land, which they leased to the farmers. What is more, each Filipino had to pay tribute in monev or natural produce of the soil, and in addition, render forty days of forced labor (this was later reduced to fifteen days); this was the so-called "polo". The friars determined the appointment and dismissal of government officials, the confiscation of properties, the deportation of wrong-doers. They decided on education, the press, the amount of taxes, the military service. They set the fees for baptism, weddings and funerals. And they lived in concubinage with native women, something which, doubtless, is not shown in statistics, but which was, at that time, an open secret. The millions of half-breeds, whose descendants populate the Philippines today, are sufficient proof ot this. Above all, however, the friars were sworn enemies of progress, determined to ruin even the moderate reforms of the Madrid government for the relaxation of the colonial regime in the Philippines, so as to preserve its ruling position. It was, therefore, just a matter of time before the efforts of Blumentritt towards the emancipation of the Filipinos would arouse the wrath of the monks - very much to the surprise of the well-meaning and fine Catholic civil servant, who could not know the dimensions this altercation would assume. Blumentritt must have defended the church in the Philippines soon after the beginning of the correspondence, because Rizal thanks Blumentritt for his good and kind perceptions about religion and he admits that the friars did bring many good things; of course the Filipinos paid well and amply for them. The friars received wealth on earth and in heaven in exchange for their Christian efforts. With ironical allusions to the situation in the country, Rizal says that the friars exchanged the fields of his Philippine forefathers for tracts of land in heaven. The farmers, however, had to lead, aside from their Christian life, a temporal one. He tries to explain to his friend (in his still somewhat droll German) the difference between Catholicism here, there, and everywhere: "Dear Sir: You know our country through books, books written by the friars, the Spaniards, and the foreigners; they copy from each other. If you had been like me, born and brought up in our villages, then you would have heard what our farmers believe, say, think, and suffer and thus you would surely think differently about Catholicism in the Philippines. I have had opportunities to study the religions in Europe. I found Christianity beautiful, great, splendid; Catholicism, stimulating, poetic ... we and our farmers know nothing at all about all this! Please pardon these remarks which I am writing frankly. You will probably find them strange because you have never heard of such things ... "
It was the first warning to Blumentritt that a territory existed which, up to now, had lain outside the scope of his studies and upon which a new world of problems seemed to be revealed to him. Because of his work for the Philippines, specially his distribution and translation of Rizal's works, Blumentritt was forced into a round of altercations with the clergy. Thus, Rizal is soon to deplore the news of his friend that the jesuits and the Augustinian friars had stopped their correspondence with him. Rizal consoles him, nevertheless, with the remark that whoever refuses an exchange of views is doubtless not worth the friendship. He adds that above all, the friars should consider Blumentritt's views since he was neither a Spaniard nor a Filipino. Meanwhile, Blumentritt himself has resorted to the pen, and in a report, referred to the government system in the Philippines as a "bureaucratic-military" rule subordinated to the clergy; a government system in which anyone who opposed the caste regime of the friars was denounced as a rebel. Arrest, banishment and imprisonment were daily occurrences; any Philippine intellectual who did not get on very well with the church, was not even for a moment, sure that he would not be arrested. ("Österreichische Monatsschrift für den Orient" (Austrian Monthly Journal for the Orient), Vienna, 1888). Blumentritt becomes even more caustic in a short note to Rizal in Paris, when he says that the friars and "Quioquiapistas" (the monicker for Spanish anti-Philippine political publicists) have lost all their senses, and that their champions among the monks represented a suicidal policy because they "have an ill-fated hand and a poisoned tongue. Blumentritt would not have done justice to his reputation as an exact scientist had he not, (or, with extreme precision had it), done it out with the friars in an exhaustive analysis. In a detailed presentation of Philippine political situation ("Unsere Zeit", (Our Time) Leipzig, 1889) he gives, first ot all, historical examples of monastic dictatorship, like that of the fate of Governor-Marshall Bustamante-Bustillo, who, together with his son was suddenly attacked by armed friars and murdered, because he carried out reforms and had the corrupt bishop of Manila arrested. This was the bishop who, after the murder of the representative of the king, took the reins of the government himself. Blumentritt quotes Governor Anda, who corroborates that the natives were flogged by the friars when they spoke Spanish. Why? "Since the Spanish officials do not have a mastery of the native dialects, and if, on the other hand, the Indios do not understand Spanish, then the friars are the only ones who can act as mediators between the government and the governed and, thereby, become indispensable to both." And Blumentritt draws the conclusion: Hence, stupidity, ignorance as bases of the monastic rule. The war for independence of the Spanish colonies in Latin America since the beginning of the past century stimulated the hysteria of the colonial rule, that Spain could well lose the Philippines. That was the signal for the friars to make themselves indispensable as upholders of the status quo: to issue to themselves and for themselves, true to the explanation which they themselves spread, licences for ever thing which they deemed necessary for the realization of this objective: "A friar outweighs a battalion of soldiers." In fact, up to the days of the Philippine revolution in the late '90's, the Spanish occupation army was limited to 11,000 men for the huge archipelago, which, transferred on the European map, would extend from Florence to Stockholm and from London to Tangiers. Sharp-wittedly, Blumentritt discerned the effect of the stupefying policy of the friars. All the same the enlightenment was not to be halted; ideas spread, but it would no longer be the enlightenment of the church, rather the liberal enlightenment from the ideas of Rousseau, Voltaire, and the Freemasons. The friars believed that they had found a weapon even against this. By accusing the representative of the enlightenment ot being an enemy of the Spanish crown and, therefore, of being a rebel and a traitor to his country. When, finally, wider and wider circles of native priests also turned against the "oppressive and unbounded supremacy of the regulares", these friars, in opposition to the teachings of the Church, did not hesitate to accuse the Filipinos wrongfully of belonging to an inferior race with limited intelligence, in the same manner that a part of the white South African church is still doing now. The result was that hatred and contempt for the monks spread among the people. Nevertheless, even in the protest movement, the loyalty for Spain still prevailed, as revealed in written petitions and demonstrations of ovations to Spain and, to the King, which at the same time, however, demanded the expulsion of the friars. "Almost all of the educated natives want the collapse of the monastic rule because they see in the friar the censor, the braggart, the enemy of every liberal, progressive, even just human-dignity movements," writes Blumentritt. He cites from a book of Father Bustamante which came out in Tagalog in which the latter tries to prove how detrimental the knowledge of the Spanish language is for the Indio. He is supposed to just tend his carabao and ricefields; knowledge and education are not supposed to be for him because whoever separated from the carabao would become an enemy of the church and king. Thus, according to Blumentritt's opinion, the clergy is abandoning its traditional weapon of light and knowledge and is subscribing to stupidity, ignorance, fanaticism. It classifies attendance in school as a temptation to apostasy and treason. It is small wonder that Blumentritt is disturbed and makes clear in his resumé how, as a devout Catholic, after difficult fights and after rescinding all trust which he might have given to the orders in advance, now disappointed, must have reached a new attitude: "I admit that up to this time I had always hoped that the Philippine orders would, mindful of their glorious past, direct their energies to the reform of their policy. I still hoped that the friars would get tired of playing the abject role of myrmidons (Italian police beadles) and delators, (common informers, people who give statements to the police, here with the meaning of denunciators). I was grievously disillusioned."